The beginning of this week, we talked about the importance of finding the right cleanser for your skin. We mentioned how important it is to look at the ingredient list to see what’s actually in the product, so you can make a better judgment about how it will act on your skin—if it will be too harsh and drying, or if it will clean effectively without disrupting your natural pH level. Today, we’re going to give you a few examples of gentle natural cleansing ingredients that will clean your skin, but also moisturize. All of these ingredients in addition to the way your skin will look and feel is the perfect reason to keep a close watch for these lovely ingredients. Aloe vera is great in cleansers. Aloe is a great cleansing ingredient. It helps to gently exfoliate while purifying pores, yet it does this gently so skin is left feeling soft and comfortable. In fact, it’s so effective at cleansing that it’s often used for oily skin. At the same time, aloe’s vitamins, minerals, amino acids, and natural moisturizers nourish and hydrate skin, so that when you’re finished cleaning, skin feels softer—not dry and tight, as is the case with many cleansers. Yet it moisturizes without leaving a greasy feel, so it’s perfect for all skin types. 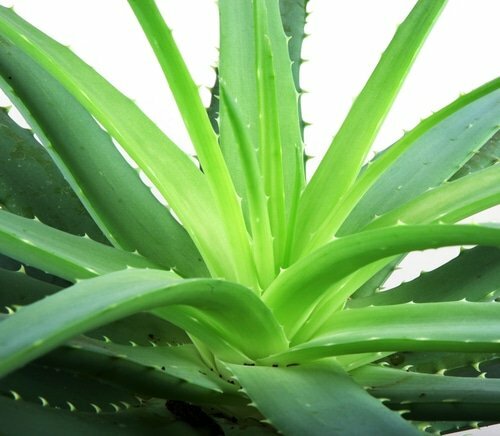 Finally, aloe contains a number of natural antioxidants, which help protect the skin from environmental stressors. Beta carotene, vitamin C, and vitamin E also help keep the skin moisturized, reducing the appearance of fine lines and wrinkles. You know that it smells good and can relax you, but did you know that lavender also effectively cleans skin? In addition, lavender can help with sensitive skin. Lavender also contains antioxidants which help protect from environmental stressors. You may already add lemon juice to some of your homemade cleansers. So lemon balm must also have cleansing properties, right? Actually, lemon balm doesn’t even come from lemons! It’s an herb from the mint family, but it smells like lemon—hence, the name. But, it does do a great job at cleaning nonetheless. Lemon balm can be used in herbal steams for oily skin. Plus, it smells so fresh and clean that it leaves you feeling great for hours. We posted on this ingredient back in February 2012, and named it the “natural cleanser” because it’s so effective for oily skin! It can help minimize the appearance of large pores and temporarily reduces the appearance of sagging and wrinkles. Hyssop can also help your skin look more vibrant and awake. In fact, it was also used historically to clean out unwanted energies from temples and sacred places—providing a fresh start. Neem helps exfoliate. This makes it the perfect cleansing ingredient for all skin types, but especially for those struggling with oily skin. Neem also works for sensitive skin. There are a number of other natural ingredients that are great in cleansers—you’ll find many of them in our products. Looking at these five may help show you the great possibilities from the plant world. We don’t need to resort to harsh chemicals to enjoy clean, hydrated skin! Do you use herbs and natural cleansing ingredients on your skin? Tell us all about your experience! Have been using Miessence (Australia) organic skin care since 2009, absolutely LOVING them because they use food and plant-based ingredients. Key word here is ORGANIC. Can you tell me level of organic ingredients in ASC, please? I bought the little sample pack recently and the products are nice but I am looking for ‘organic’ vs ‘natural’ to decide if switching to ASC is a viable comparison? Thank you! Great question! The reason our website does not say that we’re Certified Organic is because we’re not certified. It’s very expensive to go through the certification process. We spend this money on high quality organic ingredients instead of paying a certification board, who allows certain pesticides to be used at various times during the growing periods. On top of cost, some certified organic ingredients are actually of lesser quality than the ones we use to make our products. So, in this case, certifying our products could decrease the quality of them.